Bezos: "If you build a space vehicle that you have to inspect in an intense way and disassemble and refurbish between flights, that's going to be more expensive than an expendable vehicle." NATIONAL HARBOR, Md. — Amazon.com founder and CEO Jeff Bezos said he plans to invest a billion dollars next year in his rocket company Blue Origin to further the development of New Glenn, a heavy lift launch vehicle that is anticipated to fly in late 2020. 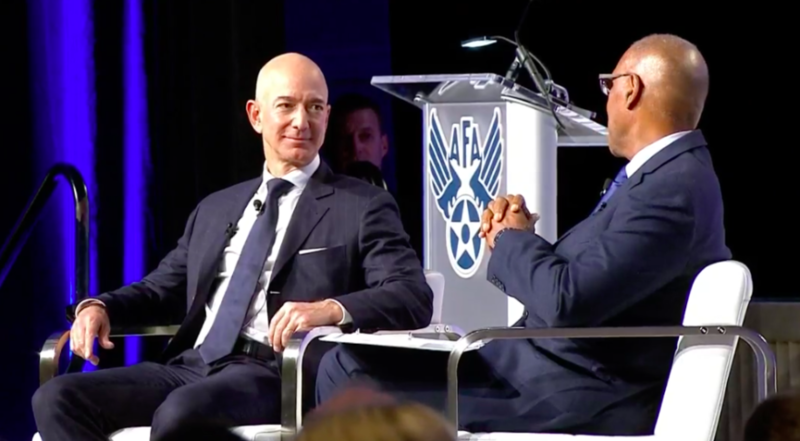 Bezos took the stage at the Air Force Association’s annual symposium in a fireside chat with AFA CEO Larry Spencer, and did not take questions from the audience. One of Bezos’ messages to a room packed with Air Force officers, Pentagon officials and contractors is that he will continue to put financial firepower behind New Glenn and space launch facilities. New Glenn, designed from the get-go with a reusable first stage, is expected to compete in the national security launch market in the coming years. The Air Force is said to be reviewing a proposal from Blue Origin to have the rocket certified to fly military payloads. Bezos showed animation videos of New Glenn, including one where the booster lands on a drone ship. “We stress availability in this vehicle,” he said. The majority of Bezos’ talk at AFA, however, was not about space. He spent the bulk of his 40 minutes on stage offering life and business advice. Some of his suggestions included: Leaders should make sure their employees don’t burn out and manage their stress. If you swing for the fences you will get more runs but also more strikeouts. Being over-scheduled stresses you out. Work-life balance is important. Work should be fun. If you’re working 120 hours a week you’re doing something wrong.